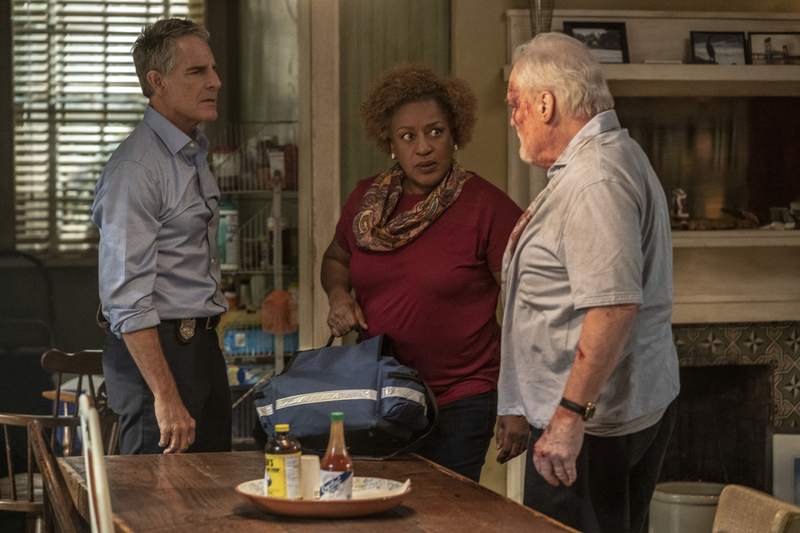 Mike Hammer star Stacy Keach guest stars as Pride’s father Cassius Pride in tonight’s 100th episode of NCIS: New Orleans on CBS. You can see some promotional photos from this flashback-heavy episode below! NCIS: New Orleans Episode 100 stars Scott Bakula (Special Agent Dwayne Pride), Lucas Black (Special Agent Christopher Lasalle), Vanessa Ferlito (Special Agent Tammy Gregorio), Necar Zadegan (Special Agent Hannah Khoury), Rob Kerkovich (Forensic Agent Sebastian Lund), Daryl “Chill” Mitchell (Investigative Computer Specialist Patton Plame), and CCH Pounder (Dr. Loretta Wade). Guest stars in “In The Blood” include Alice Kremelberg (Arlene), Amy Rutberg (Angel), Bryan Terrell Clark (Todd Jamieson), Jason Alan Carvell (Jimmy Boyd), Melinda McGraw (Gina Powell), Stacy Keach (Cassius Pride), Mark Kubr (Red), Annika Pampel (Pride’s mom), Craig Cauley Jr. (Young Jimmy), Justin Miles (Young Cassius), Keyara Milliner (Woman), Nick Basta (Dario Silva), and Preston Richardson (Young Dwayne).